Caution; moose stuffed animal crossing! Slow down and have a look at our amazing stuffed moose and plush moose. These wonderful stuffed animals come in all sizes, from three inches all the way up to twenty-six, and many different styles as well. 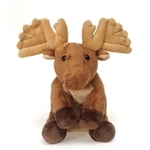 We have realistic stuffed moose, cuddly and cute stuffed moose, and even plush moose puppets and finger puppets. If you know a moose lover then there is a stuffed moose here that will make them smile. There's even a plush moose hat for the moose lover that wants to go out in style! Some people are lucky enough to live in a place where they get to see a moose crossing the street or walking through their backyard but for the rest of us a stuffed moose is the only way to see one of these great North American animals up close. To see our moose stuffed animals up close all you have to do is click on the pictures below. Call us with any questions about a particular plush moose or send us an email and we'll gladly tell you everything there is to know about our great moose stuffed animals!